How thoughtful are you and your learners – towards each other in class? Towards your learning? Towards the task in hand, whatever it may be? For a lesson to be truly great, I would like to suggest in closing this series that thoughtfulness, on several different levels, is essential. By thoughtfulness, I mean something quite different from thinking. Thinking is a process – an activity in which we engage as and when required to solve a particular problem by rational or intellectual means. For example, we may spend time thinking about whether to use the present perfect or the past simple in a particular utterance, or thinking about how best to open a stuck jam jar, or thinking about how best to structure an essay in order to meet the requirements of a given rubric. This is all valid and necessary, but it is not what I mean when I say that lessons should be thoughtful. Being thoughtful is – as the phrasing suggests – a way of being, a state, not a process. As such, it is less of a tool than thinking might be said to be, and rather more of a basic setting or configuration of a human being. In fact, I would like tentatively to suggest that thinking is subordinate to, and recruited as needed in the service of, thoughtfulness. As I go on, I hope to make clear why I think this is important and suggest some ways that this could be achieved. absorbed in or involving thought : brows drawn together in thoughtful consideration. • showing consideration for the needs of other people : he was attentive and thoughtful | how very thoughtful of you! • showing careful consideration or attention : her work is thoughtful and provocative. Appropriately enough, this dictionary definition got me thinking. Let’s take each element at a time. Thoughtfulness is a state of absorption – of high focus and attention. I discussed attentiveness earlier in this series but one thing I overlooked then was the question: what conditions are necessary for attentiveness? There is one condition that I would like to suggest is important on occasion – and one which we (as teachers and as people) are often uncomfortable with – and that is silence. Scott Thornbury wrote an excellent post on this topic recently and I will not attempt to better it; suffice to say that the services that silence can offer in the classroom are worth exploring. More interesting for me were the second and third elements of the definition: showing consideration for the needs of other people, and consideration of the work at hand. For my thoughts on attentiveness to the work at hand, please see my earlier post on attentiveness. Consideration of our learners is of crucial importance for teachers as well as learners if a collective learning environment (AKA a lesson) is to be successful. We need to be thoughtful towards our learners, their needs and their wants; their hopes and their fears. It is a teachers’ commonplace to talk about taking learner needs and interests into account and being learner centred, but perhaps this focus is mostly to be seen in advance of classes, in the planning stage? How often in lessons, in the heat of the moment and under the pressure of a busy teaching day or week, do we as teachers become rather less thoughtful towards our learners and their immediate needs? In the interests of moving the lesson along, or for some other managerial reason, we may sometimes fail to be fully thoughtful. This is of course unavoidable, as maintaining a truly thoughtful state of mind is something that most of us are probably not accustomed to. But it may be worth thinking about how we might help ourselves avoid being jarred out of a thoughtful state of mind in class. plan less, both in terms of stages in a lesson and in terms of lesson time accounted for in the lesson plan. Allow white space. encourage (but do not enforce) silence and stillness. 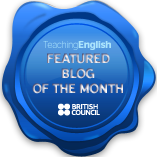 try out activities where learners work on single tasks under no especial time pressure. Use intrinsic interest of the task rather than time to establish focus. Take time every 5-10 minutes or so in a lesson to take some time for yourself. Walk to the window and look outside at something particular (e.g. a tree or a cloud) and watch it uninterrupted for a full 15 seconds (this will be challenging to start with, as your attention will wander). Use this time to clear your mind by focusing on the image before you. Then close your eyes briefly, store the image, and return to your learners and their work. • an idea or mental picture, imagined and contemplated : the mere thought of Peter with Nicole made her see red. • an act of considering or remembering someone or something : she hadn’t given a thought to Max for some time. • (usu. thought of) an intention, hope, or idea of doing or receiving something : he had given up all thoughts of making Manhattan his home. 2 the action or process of thinking : Sophie sat deep in thought. • the formation of opinions, esp. as a philosophy or system of ideas, or the opinions so formed : the freedom of thought and action | the traditions of Western thought. • concern for another’s well-being or convenience : he is carrying on the life of a single man, with no thought for me. Lessons should be events filled with ideas and opinions – but this does not entail that these need all be vocalised. A quiet classroom is not necessarily an unproductive classroom. The central thing is to generate and work with ideas, through language. This may be best done at times through writing. Deep thought, or contemplation, is sometimes necessary; simple rote-learning will not work for all language learning problems (howver much a fan I am of repetition drilling in all its forms, as Jeremy Harmer has written about recently). Tasks and time and space conducive to extended and careful thought about a language issue are essential parts of a lesson. Remembering, recollection, review, recap.are however, also important – learning is, after all, simply remembering that you know something. Lessons – whether we are conscious of it or not – are receptacles for our learners’ hopes and intentions, and we as teachers need to behave thoughtfully towards them. Incidentally, lessons are also receptacles for our own hopes and intentions – when was the last time you thought about that? Thought is as much about formation as form; it is about emergence, about work in progress. It is not a state of absolutes, but of provisions. Teachers and learners often hunt for certainty and closure in learning; it is important to recognize that this is not going to happen and that the demand for perfection is the enemy of the acceptance of good. Concern for our learners’ well-being or convenience needs to take more of the place of attitudes such as “tasks need to be designed so that they are hard to do”. As teachers, it is easy to excuse obtuse task design by saying that it promotes other skills (such as asking lower level learners to write sentence-length answers to listening tasks when a simple tick box design would prove comprehension as effectively without dividing the learners’ cognitive resources). So with that thought, I would like to bring this series to a close. I would never have thought that I would have so much to say about what was, in truth, an off-the-cuff quip in response to Mike Harrison’s initial question, but I am very grateful to him for giving me the opportunity to think this all through, and so I would like to dedicate this series to him: cheers, Mike. Thanks for the inspiration, Mike! A thoughtful post, as usual 😉 Thanks for this series. Must find time to run through them again. Thanks very much for this post, think it is my favourite actually. Sharing it with all the teachers at our language institution. Thank you, Valeria. I’m happy you’ve enjoyed the series up to the end! It would be interesting to hear what your colleagues have to say about it. Very nice post Anthony. Very nice indeed. White space for something to happen that you can exploit or just let grow. I seem to have a lot of white space lessons because 1)I have 121s with no syllabus or real needs from the students 2)They don’t tend to do any prep for homework that I give like listening to an MP3 or even revising 3)They come/call late, sometimes VERY late BUT 4)The best classes seem to be where the warmer just develops. In my 2 hr CPE+ class this is what’s evolved. A basic chat, then more chat, discussion, work on synonyms, collocations and lots of culturally-bound language and phrasing. The student doesn’t want a lesson, just discussion. Sometimes he does an essay/text and I we discuss/argue about how to rephrase things depending on the hidden meaning and overall tone of the piece. Rather surprisingly all these students keep rebooking courses so they must enjoy this white space. One who is doing a more structured conversation course just mailed and said she just “wants to talk” in the last class. Well I can,’t argue with that. Thanks Phil. It’s interesting that learners rebook courses on the grounds that they enjoy being offered space to participate and contribute; less in the service of a syllabus and more in the service of their own interests. Yes.Generally there’s no syllabus. New email just arrived asking ‘can we talk about the differences between our cultures?’. Another lesson tomorrow is supposed to be on negotiations based on a recording but it will (as tends to happen a lot) end up as a conversation about working life, today’s activities and important things that need to be said in English. Now to me these things are important and so my warmers are more of a NA/litmus test. For the boss a happy student is a renewing student and so it seems they are getting what they want and as there are no formal tests then the emphasis is purely on helping them get to where they want to be. Yes, there is an element of ‘it’s cool to speak English’ at the start but then it fades and the students, I hope, get something useful out of the class. 1 student went from pre-int IELTS 3 to strong int/weak upper-int IELTS 5/5.5 from scribbled 4 line plan. I follow what you said about your first school ie ‘find out what they need and give it to them’. Glad to have you back in the blogging world again Anthony!! I have to go watch Clone Wars, I’m addicted! Glad to be back, and glad you are still here! I have enjoyed reading the GREAT series very much. I like particularly like this idea of thoughtfulness. Not so keen on ‘mindfulness’! Looking forward to your next post. That mindfulness thing… I hear you, but I have to admit to being quite taken with it when I first came across it – in the contexts where I came across it, the idea of being full of mind as opposed to thought was appropriate and valuable. I do think that is is getting rather overused though, so I can definitely see where you are coming from there! Thanks for stopping by, and I hope I can maintain your interest! An amazing series of posts, Anthony! Really enjoyed reading it! You are a genius! Aw shucks, Chia – you’ll make me blush! Thank you! I’m a little sad too, funnily enough: I realised after posting the final installment that I hadn’t really said everything I had wanted to say. So in a way it’s good that the British Council has given me a platform to make good on that. I need more time to work this one through fully though, and I guess I’ll take this one on the road; if anyone wants to hear it, that is. A fantastic post! I am going to read the other four soon. I have always thought that I have quite radical views in the realm of what goes on in the name of EFL teaching. I have never voiced them because I was never confident if I am right. Things like lesson planning, stages in a lesson, pair-work, teacher talk time are some of the ideas that are just being followed by so many without their effectiveness being questioned. The space for creativity during a lesson is being encroached upon by so many factors driven by so many other factors. 🙂 Thank you, Anthony, for giving such a roaring voice to ideas that need to be discussed and debated and even chopped off from EFL/ESL teaching. Thank you for your very kind words. I think the world could do with a few more radical thinkers and voices to counterbalance the conservatism and fundamentalism out there – so let’s all roar together!